Karan Thapar is back in the news! 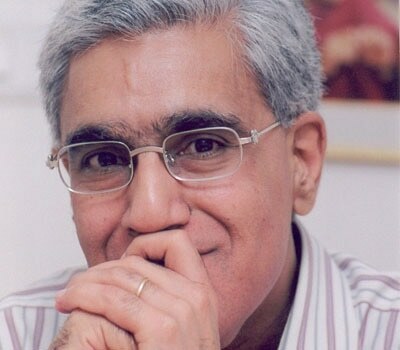 (Karan Thapar – journalist, commentator and interviewer – has got people talking again with his recently launched book ‘Devil’s Advocate – The Untold Story, in which he relates his encounters with various well-known personalities he has interviewed. Below, Aurora shares from its archives, two interviews conducted with Thapar; one back in 1998 and the other in 2003. Also included is a piece written by him in 2000, in which he recounts his meeting with (the then) Pakistan’s Chief Executive, General Pervez Musharraf. Karan Thapar succumbs to the charms of General Musharraf. Sometimes the most unlikely things can leave a lasting impression. You don't expect them, you certainly can't plan for them, but when they occur they change everything. In a flash all that has happened before alters and all that is to follow is conditioned. Last week, this happened on two consecutive days but in two separate countries and with two quite different people. One of them was General Musharraf. The other was Shah Rukh Khan. I was in Islamabad to interview Pakistan's Chief Executive. As an Indian interviewer, my first objective was to get him to accept he is a military dictator and that his claim to be restoring democracy is codswallop. The other was to talk to him about how his actions, or lack of them, were the real problem in Indo¬-Pakistan relations. As you can imagine it's not the sort of task that will endear the interviewer to the interviewee and I must admit there was a certain apprehension in my heart. After all, you can't sit in a man's drawing room and call him a tamashah to his face and not annoy him. Well, I did my bit. I called the General a dictator, I told him that in Indian eyes his sincerity and credibility were utterly suspect and I claimed to have discovered the contradictions that bedevil him. He is an army chief who has overthrown an elected prime minister in the name of democracy, yet wants his protestations to be taken at face value even though he is not prepared to do very much to prove his credentials. As I put it to him, what could be more bizarre than that? The General simply smiled. In fact it wasn't long before I noticed he was unperturbed. Of course, he defended himself, always fluently, often ably, and even nodded in agreement with some of the comments I made. By taking my critique on the chin and showing no anger, he cleverly defused it. During the commercial break, instinctively feeling I needed to make small talk to keep a relationship going, I complimented the General on his tie. I had not expected any response; leave aside the one I got. "Do you really like it?" he asked, a smile lighting up his face, and his voice revealing the same innocent pleasure that you or I would feel if someone had admired our clothes. "Yes I do," I said. "It's very attractive." Then the interview re-started. Part two was on Kashmir which means the disagreements were sharper and the potential for acrimony greater. Half an hour later, when we ended, the tie was the last thing on my mind. My thoughts were on making a polite but fast getaway. "I'd like you to have this," General Musharraf suddenly said, undoing his tie. "Please let me give it to you." "Sir, sir, sir... " I stammered, "that was only an innocent remark. I wasn't hinting or anything." "I know," he replied. "It's my gesture of conciliation to you." "Thank you," I said, still shaken. Then looking at the gold tie-pin and chain now dangling on his shirt I added with a laugh: "I should have admired the gold chain. Maybe you would have given that to me as well." "Haan," he said, "aur agar aap ko jootie pasand aayee hoti tou woh bhi mil jaati! In a flash the tension evaporated and the mood was full of bonhomie. The spontaneous gesture of gifting his tie had brought about a sea of change. It wasn't only I who felt it. My colleagues, who had come with me from India, were equally aware of the altered atmosphere and the fact that General Musharraf deserved credit for it. Their verdict said it all: "Banda sahi hai. Burra nahin. Dil ka saaf hai." Back in Delhi the next day, but in altogether different circumstances, much the same thing happened with Shah Rukh Khan. We were chatting over a cup of tea before an interview. Such conversations are never easy. Neither side knows each other, both are self-conscious and there's a tendency to try too hard. Silence would be better if one had the guts or wisdom for it. 'The one thing I can't stand is posing for photographers," said Shah Rukh. "It makes me feel silly and look stupid. That's why you never see pictures of me posing with actresses. I always refuse." Shah Rukh had sensed that there were several photographers waiting, professionals, amateurs and, of course, anxious fans. His unprompted statement was a clever form of advance warning. It had its effect and all around faces fell. I knew that there would be a high level of disappointment I would have to contend with, but my hands were tied by Shah Rukh's sentiments. So when the interview ended, the photographers were only permitted to click whilst I talked to him. That way he wouldn't be posing and they would get a brief, if limited opportunity to take their pictures. The problem was I would be in the frame, or at least difficult to exclude without spoiling the photograph. "Sir," said the BBC's photographer, "just one by the wall beside the logo." "You want me to pose?" Shah Rukh said, his voice betraying his mounting dread. "Haan sir, ek yahan pe our phir ek do wahan pe." I expected an explosion but instead, he got up like a lamb and complied. No doubt he looked uncomfortable but he fulfilled every instruction from the man without demur. Every one of them was a request to pose. Shah Rukh tried to look natural but it was painfully, self-¬consciously obvious he was hating every minute of it. Soon other photographers joined in and a regular photo session began. "Arre yaar kya kamal ka aadmi hai," one of the photographers said once Shah Rukh had gone. "Aap vaise hi ghabra rahe thhe. Star aadmi hai. Meine camera kholi our dekha kya pose diya." Thank you Shah Rukh for saving the day. And thank you General Musharraf. Every time I wear your tie, I shall fondly remember my visit to your home, Army House in Rawalpindi. There has been a successful proliferation of news on television in India. There are already eight or nine national and 40 regional news channels, and in the last six weeks, five new national news channels have been launched in India. Sahara Television plans to launch another 20 news channels nationwide, specifically targeting regional groups. The advertising industry, however, is not growing as rapidly, and although news channels are being established at the cost of entertainment channels, the crunch will come in news, and eventually only two or three market leaders will survive. It is perceived to be a very glamorous and fashionable profession in India. Men and women in the 18 to 25 age group, are gravitating towards the profession simply because of the glamour. Initially, there was a tendency for channels to hire people from amongst the established elite, but recent years have seen the induction of an increasing number of people from the middle class. Employers are not demanding; the average reporter on Sahara will be someone who’s confident and fluent in the relevant language of communication, which in most cases is Hindi. There have been major breakthroughs in programming, Kaun Banega Crore Pati was a huge success, and I recently saw a not-so-good copy of the programme on Pakistan television. Star Plus has the largest chunk of the top 50 programmes on air, and dominates this aspect. Indian television has produced a few very successful soap operas, but dramas are definitely missing, and I’d say are a weakness of Indian television. Another fundamental weakness that has plagued Indian TV is the lack of quality current affairs programmes and documentaries. There are three reasons for this. Firstly, we don’t have good producers in India. Secondly, channel heads in India believe Indian audiences don’t have the attention span for such programming, and therefore find it financially unfeasible. Lastly, all the channels have failed to grasp a shift in viewer opinion; that they are tired of watching politicians being bashed, and the usual political tamasha they were earlier fond of, simply because of its novelty. There is a difference between what I hope and what may happen. In my opinion, this time it’s different because it’s not a straight jump to something like the Agra summit. India has realised that coercive diplomacy does not work and has offered to talk about it, so there is a change in strategy. Both countries have to be more accommodating of each other’s problems; this path has to be walked more resolutely and with a greater determination, as both countries are now nuclear states. If there is an exchange of High Commissioners and a restoration of air and rail links, this will be more than enough to start with. From what I’ve seen of newspapers and television in Pakistan, as well as in India, I think that the media is supportive of better India-Pakistan relations. Imposing bans on each other’s electronic media is silly. Even if one considers the other to be the enemy, it’s still better to know what the enemy is up to. Whether in front or behind the television screen, creating news is a passion for Karan Thapar. As a foreign journalist, he has the distinction of having interviewed Benazir Bhutto on three occasions and the (late) General Ziaul Haq once. In this interview, in his office in New Delhi, Thapar (President for Current Affairs at UTV – one of India’s oldest production houses) spoke at length about the television revolution in India and its impact on the medium. Aurora: Karan, although you now spend most of your time ‘behind’ the cameras as it were, audiences in Pakistan will probably remember you best as the compere for Special Session which appeared on Star Plus in the run up to India's last General Election. Tell us about the programme. Karan Thapar: Special Session was produced by a company called the Adhikari Brothers, under my direction as President of the company. It was one of the most successful current affairs programmes on Star. Its ratings were the highest of all comparable programmes on Star during the election period. It was also hugely profitable as its sponsorship value was approximately 400 times more than its actual production cost. A: Did you enjoy compering it? KT: I did. Enormously. And I suspect it showed too. A: Apart from Special Session, viewers in the region may have seen your programme In Focus with Karan on Home TV. Is the fact that you left Home TV the reason why In Focus no longer appears? KT: No. In Focus continued to appear until September, despite the fact that I had already left Home TV by then. All that happened was that when I joined the Adhikari Brothers as President, the programme instead of being produced by Home TV was produced by the Adhikari Brothers instead. A: What happened to Home TV? KT: Home TV was launched in 1996, as a result of a merger between five companies. HTV (Hindustan Times Television), Pearson and Carlton Television from Britain, Television Broadcast in Hong Kong and Schroder Wag. However, by May 1997, it was running into problems mainly because its shareholders were not certain what sort of television channel they wanted it to be. Five shareholders running an organisation became problematic. Two began to voice concerns that India was not an operation they really ought to be in, that perhaps they were wrong to have gone in the first place. The problems of government controls, of adapting to the ethnic product required for an Indian market, that may pretend to speak English, but actually enjoys a different form of entertainment because they are used to Indian movies, all these problems presented themselves to the shareholders. Two opted out. The remaining decided to shrink and at that point it made sense for me to leave because they were going in a completely different direction. Home TV has now been acquired by a company called Sahara which also owns an airline by the same name and in December or January, it will reappear as Sahara TV. Presently, it still goes on air as Home TV but for the past 18 months, it has commissioned no new programmes and in September even In Focus ended. A: Satellite TV is booming in India, in fact television per se is booming. How many channels are there in all? KT: There are two nationwide Doordarshan (DD) channels and there are sixteen or seventeen regional language DD channels and an international DD channel. All together there must be about twenty one channels in the DD family. DD1 is probably the most heavily watched channel in the country. It's aimed at rural, small town, rather than urban, India. It has limited viewership in Delhi, Bombay, Calcutta, Madras or even in India's other one million smaller cities. But in rural India, where satellite television is non existent, the appeal of DD1 is enormous. DD1 is therefore a sort of public service channel, it telecasts programmes like Krishi Darshan for farmers, public service messages, programmes with moral contents. DD2 is an urban channel and therefore more up-market. However, in the last two years it has taken a real knocking from satellite television. Prior to that DD2 did extremely well. It was only when the television revolution took place in India that DD began to suffer. A: What exactly do you mean by the television revolution? KT: It began during the Gulf War, when urban, upper middle class Indians found themselves addicted to watching the war on CNN. For those without access to CNN, hotels arranged special areas in their lobbies where people could watch it. Then cowboy operators came along and set up cables all over the place, stringing wires across the streets, connecting neighbourhoods and then localities. What they were doing was connecting peoples' homes to a central dish. Imagine, one big dish connected to different homes, just by ordinary wire mind you, not by fibre optic cable. At one point in time, India must have had something like 100,000 cable networks. A: So the television revolution in India can be directly attributed to CNN? KT: Yes. The second big invasion after CNN was Star. But the TV revolution really took off in a big way when Zee came along and set up the first Hindi satellite channel. It was started by a businessman who had no knowledge of television nor of the media, but he had a very sharp business sense. He must have said to himself something like “hang on, Indian television is dreadfully dull and boring. Most of us are captive watchers of DD and those who can afford to watch something else through the cowboy networks are doing so. But if I were to create a television channel in Hindi, meeting Indian taste, reflecting Indian values and allow for a rich diet of Hindi movies, they will all switch to me.” And they did! The programming was cheap, it was pretty appaling, but it was in Hindi and it reflected what are considered to be Indian sub continental values. It had Indian tamashas and Hindi movies. It caught on and spread like wild fire. And it made money. A: Even in the rural areas? KT: No, because of the lack of satellite connections. But Zee was imitated by others pretty quickly which is why after Zee the television revolution in India took hold. Imitators included TV India, which hasn't done very well, but is still surviving. Sony which is close to making money. Later entrants to satellite were Home TV, MTV, the V channel and all the offshoots Star has spawned including Star News. Altogether one now has what is called a bouquet of channels. Add to that the foreign channels that range from Italian to Arabic, from French and Spanish to Turkish. A variety of American channels that come and go depending upon how they fare NBC, CNBC and of course the BBC. In all there must be about fifty channels available in India. A: How do they survive? KT: In India, foreign channels telecast programmes that have been already shown elsewhere. They make their programmes for their home audiences and that's where they are costed and paid for. All that happens is they are recycled on a satellite and shown in India at minimal cost. They are not making money on their channels here but that is not their intention either. What they are doing is establishing an international identity for themselves. It's like corporate advertising for a company. A: What about the Indian channels? KT: They are there to make money although at the moment they aren't. Sony is perhaps now slowly making a small profit but it has cumulative losses for the last four years that will take a while to wipe out. To make money in television, you have to loss lead for many years. You have to begin with a portfolio of programmes, you have to advertise them and continue to remain in existence at great expense and hope that eventually people will become aware you exist, begin to like your programmes and watch them and in this way, you start wooing audiences away from other channels, or more likely you create new audiences. More and more people are watching TV than ever before so that each new channel doesn't divide and fractionalise the existing audience but adds to it so that the cake gets bigger. A: Isn't the gradual change over to newer TV sets impacting on the number of people who now watch satellite television? KT: Yes. If you do a survey you will find that the number of people who can, in theory, access Sony, Zee or Star is growing. But the number of people who actually watch it isn't growing as fast. This is because most people in India still have outdated television sets which can only receive eight to ten channels. What this means is that while cable operators might be supplying a viewer with as many as forty channels, he or she may only be able to access only ten. Now as more and more people buy new sets, they will be able to access all the channels made available to them by their cable operators and this in turn means there is a steady growth in the number of new people who are watching satellite. A: What about demographics. Do different audiences watch different channels? KT: Broadly speaking. Middle class Indians watch Zee in a big way, then Sony and a little bit of Star and DD2. They watch MTV, the V channel, Zee movies and Star movies. Sony is the younger generation's choice, young professionals and newly married couples where double income families are the norm. Now on at least two days of the week, Sony gives Zee not just a run for its money but beats it in the ratings. On other days it's behind Zee but it's catching up and creating a thrust and a dynamic of its own. Most of Sony's viewership is still in Bombay, but it is acquiring a large viewership elsewhere. Zee tends to attract the thirty plus age group as well as young kids. It's more conservative, more "mass." DD2 has lost out in a big way. It's now re inventing itself and one will have to wait and see what the outcome is. Middle class Indians probably don't watch the BBC because the language is not completely their own and it covers parts of the world they are not really interested in. If they want news about India, there are Indian news channels that provide more in depth news. CNN is hardly watched at all except in hotels. The high viewership channels are Zee, Sony and the music channels. As for the sports channels, when a cricket match is transmitted, they become the number one channels. Whenever there is a major cricket match between India and Pakistan everything else is wiped out. A: What about Star TV? KT: Star used to be the channel most westernised English speaking Indians watched. However when Murdoch took over he decided Star had to become more Indian or it, wouldn't grow. While making it more Indian in content, he tried to retain Star's marketing perch as the number one channel. The danger is that the more Indian you become the less you become unique from a marketing perspective. At the moment companies are still prepared to pay over the odds to advertise on Star because even though compared to Zee and Sony, the audience is negligible, they are getting quality eyeballs watching. But as Star starts to "Indianise" its programmes the danger is they will lose those quality eyeballs even though the eyeballs may double or triple. Star is in a bind here. Their costs have gone up because instead of buying programmes that are cheap they are making them in India. Many people say Star's experiment has failed, that it was better off the way it was. Other people say this is a long process, one can't judge the end result in just a few years. A: We have witnessed the "Indianisation" of Star Plus. Is the same likely to happen to Star Sports? KT: Star Sports has some programmes that are made in India. For instance it has a Sunil Gavaskar presented chat show. It also had a small element of Indian football and even attempted Indian hockey, but neither of them succeeded and they were withdrawn. Now Star Sports has begun what we call in India, League Cricket. But again, it doesn't really work. What really works on Star Sports are cricket matches between India and Pakistan. Other cricket matches that draw large audiences are when foreign teams come to India to play or the Indians go abroad. Matches which have no India or Pakistan element to it — England versus South Africa, Australia versus Sri Lanka for example, attract relatively smaller audiences. A: There has also been a proliferation of production houses. Is that reflected in the quality of programmes? KT: Yes. The range of programmes, as well as their technical quality is improving. Previously programmes were cheaply and roughly made. Partly because of economic reasons. For example when Zee first started in 1991 it was possible to commission a programme for as little as 40,000 rupees, so to make a profit, cutting corners was the only option. Today one would have to pay double that amount and perhaps more for a good current affairs programme and at least eight or nine times more for a good drama programme. The second reason why they were rough was because most Indian production houses had little experience of making programmes for television, so they were learning on the job. Since then channels are making money. They are competing not just in terms of ideas but also in terms of the quality of programmes. They are now prepared to spend on programmes to stay ahead. Thirdly and here l give credit to Sony, who came to the conclusion that there are particular niches you can make your mark in. So there is a particular type of programme which is a Sony programme. It's cheeky, it's irreverent its politically incorrect, loud, brash, young and "very Bombay". A: Have the BBC and CNN contributed in improving the quality of programmes? KT: BBC has had a major impact in the quality of news reporting, both in terms of journalism and the visual content. Star News is good in terms of quality. In terms of journalism, it's very cautious, not necessarily accurate, just cautious. Star plays safe with breaking news. Star is also thought to be prejudiced in favour of the Congress party. One of the stories doing the rounds is that when Pranoy Roy asked Vajpayee for an interview he replied "ask Sonia instead." This may be just a story but it did the rounds in a big way and is damaging to Star News' credibility. The BBC and CNN have made people aware that speed is important and that live news on television can be exciting, because it can make the audience feel what it's like to be where the action is. Despite all its problems DD provides. the most credible and I would say the best Hindi news in the country because of Aaj Tak, produced by the India Today Group. The programme is telecast every night at 10.00 p.m. on DD2 and many consider it to be the best news programme in the country; better than Star News which it beats in terms of content. The advantage of Star News is that it's round the clock which makes it exciting to watch when news is breaking. A: What about chat shows and dramas? KT: There are three types of non news programmes. There are dramas, soaps and serials, all are badly acted, poorly scripted and very narrowly focused. However, they are sophisticated in their production techniques. They are well shot, the actors are well dressed, the props are good and the locations well chosen. But the narrow focus and the repetitive nature of the stories, plus the fact that they stretch for hundreds of episodes that seem to go on forever, makes them tiresome. A: How much research is carried out to assess the success of a programme? KT: Quite a lot. There are extensive focus group studies to assess whether the plot is going in the right direction. With which character is the audience identifying with, who should be killed and so on. Certainly producers don't experiment enough, they prefer to keep the story line simple along the sort of themes Hindi movies have established as formulas that work. This is to minimise the risk factor. However there are some serials that are different. One is Saas, shown on Star Plus. It's different because it is an intense story of emotion and love. It works because of the intensity of the emotions. A: What tools do advertisers have at their disposal to measure audience viewership? KT: There are two types of Television Rating Points (TRP). The first is the diary system, whereby a certain number of people are given a diary of programmes and asked to record from memory which ones they watch. This is rather inaccurate because memories are often wrong; people tend to tick programmes they think they watched and they always think they watched their favourite, so the system is heavily loaded towards programmes that are popular and against programmes that are good, but are just new and so are not always remembered. To overcome this, in Bombay and Delhi, a new system called the People's Meter System (PMS) was developed whereby every time you switch to a channel the system automatically records what you are watching. But even that is unsatisfactory because even in Bombay PMS was available in just two hundred households. A: How strong is the competition for advertising? KT: Before the television revolution, DD2 was the only channel worth advertising on. A programme on DD, good or bad was a passport to making money. After satellite, channels like Zee made a lot of money. People have realised that audiences watch programmes, not channels. Until about two years ago the size of the advertising cake was growing at a rate of about thirty percent a year and the share of the electronic media within that cake was growing too. Now growth is about five percent with the result that many of the channels that emerged in the hope of a share in the growing cake are going to the wall. A: In all this what happened to radio? KT: Conventional radio is being wiped out. But something happened a few years ago which spread like wild fire in urban India amongst young kids who create it, listen to it and produce it and that is FM Radio. FM Radio has completely taken off in Delhi, Bombay, Calcutta and Madras. It would have taken off even more if the government hadn't played games by giving franchises to private companies and then cancelling them. But even that can't wipe out the entrepreneurial drive of these kids aged between eighteen and twenty four. They often mistake their verbosity for wit. They jabber and chatter. Sometimes it's rude, it's even crude if not lewd, very suggestive, utterly meaningless and great fun. And they play very good music. A: At this point in your career what are your future plans? KT: Well I joined United Television as President for Current Affairs in August so it's a bit early to think too far ahead. A: What about a switch to a career in politics. Is that a possibility? KT: Possibly, perhaps probably. But I cannot say for certain. One of the best and non biased Journalist of India, voice of every sane person.